Conference registrations cancelled on or before 12:00 noon Mountain Time on March 7, 2019 will be entitled to a full refund less a $15 handling & processing charge. Registrations cancelled after this deadline will not be entitled to a refund. Choose the 'Individual Registration' button upper left to register. Kristina Jacobsen holds a Ph.D. in Cultural Anthropology from Duke University, the MPhil in Ethnomusicology from Columbia University, a master’s in ethnomusicology from Arizona State University, and a bachelor’s degree in music (flute performance) and history (concentration: Native North America). Based on 2 ½ years of singing and playing with Navajo county western bands, her book, The Sound of Navajo Country: Music, Language and Diné Belonging (2017, University of North Carolina Press), examines cultural intimacy and generational nostalgia on the Navajo (Diné) Nation. This book is the first in a series, Critical Indigeneities, edited by J. Kēhaulani Kauanui and Jean M. O’Brien and focusing on contemporary indigenous experience and critical theory. Her research interests include: music and language, anthropology of the voice, politics of authenticity, indigeneity and belonging, music of Native North America, Sardinia and the Appalachian Mountains, race and musical genre, music as cultural performance, indigenous language revitalization and U.S. working class expressive cultures. Her latest ethnographic project focuses on American music, settler colonialism and Sardinian language politics on the Italian island of Sardinia. Together with Kerry F. Thompson (Diné, Salt Clan), she has a forthcoming article on the recent Navajo Nation presidential election and language fluency debate, titled “The Right to Lead: Language, Iconicity Diné Presidential Politics.” She has a chapter focusing on ethnography and songwriting in the forthcoming book (Spring 2018), Arts-Based Research in Education: Foundations for Practice, edited by Melisa Cahnmann-Taylor and Richard Siegesmund. Together with the late Shirley Bowman (Diné; Bitahnii) she has another forthcoming article on kinship, blood quantum and adopted clans on the Navajo Nation. Recent articles include “Radmilla’s Voice: Music Genre, Blood Quantum and Belonging on the Navajo Nation” (Cultural Anthropology, 2014) and “Rita(hhh): Placemaking and Country Music on the Navajo Nation” (Ethnomusicology, 2009). 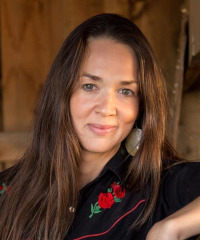 Kristina has taught courses in linguistic anthropology, Native American Studies, ethnomusicology and cultural anthropology at Duke University, Diné College and Northern Arizona University. Kristina is a touring singer, songwriter, lapsteel player and country artist (she fronts the all-girl honky tonk band, Merlettes). She recently completed solo tours in Denmark, Sweden and Italy, and also taught songwriting workshops to inmates in the Swedish and Italian prison systems. Her recent solo album, Three Roses, was nominated for three New Mexico Music awards and is a collaboration between songwriters and musicians in Denmark, the United Kingdom and the U.S. To learn more about her research, teaching and music, visit http://www.kristina-jacobsen.com. Durango guests may fly directly to DRO, Durango-La Plata County airport, using United or American Airlines. The airport is 15 miles outside of town in a rural environment, so hotel shuttle service or car rental is required. For more information, visit http://www.durangogov.org/index.aspx?nid=202. Shuttle service is free in town (including to/from campus) and costs $15 for round-trip airport transport. Shuttle runs by appointment from 5:00am to midnight. This hotel is walking distance from scenic Main Ave., Durango’s premier arts and food district. Shuttle service is free in town (including to/from campus) and to the airport. Shuttle runs by appointment from 7:00am-11:00pm. Complimentary shuttle service is only offered to the airport. Shuttles begin at 7:20am and run every hour until 8:20pm. These hotels are situated on or near scenic Main Ave., Durango’s premier arts and food district. They do not offer shuttle service. Historic Strater Hotel (970) 247-4431, 699 Main Ave. The General Palmer Hotel (970) 247-4747, 567 Main Ave.
Rochester Hotel and Leland House (970) 385-1920, 726 E. 2nd Ave.
For those who would prefer not to rent a car, it is recommended that visitors select a hotel with in-town shuttle service. While the campus is geographically close to most hotels in Durango, it sits atop a mesa that makes walking to campus from the downtown area strenuous. Uber is operational in Durango. However, the small number of drivers leads to hit-or-miss availability. Please do not depend on Uber for early-morning transport to DRO. Durango Cab Service also provides reliable transport, (970) 259-4818. Durango is a scenic 3.5-hour drive from Albuquerque and 6-hour drive from Denver. Weather conditions in late March should be amenable to drivers from all directions, but drivers are encouraged to check CDOT for road conditions on the Colorado mountain passes before their trip (https://www.codot.gov/travel). Durango is known for high-caliber hiking, mountain biking, road cycling, and skiing. It also has a high number of restaurants and bars per capita, serving tastes from casual to fine dining in a relaxed atmosphere. Visit https://www.durango.org/ for tourism information. Conference activities will take place in Jones Hall on the Fort Lewis College campus. Parking permits are available for Friday, $5 per day, from kiosks at campus entrances. Parking on Saturday is free.